The Workbench Diary: Now Open For Pre-Orders! 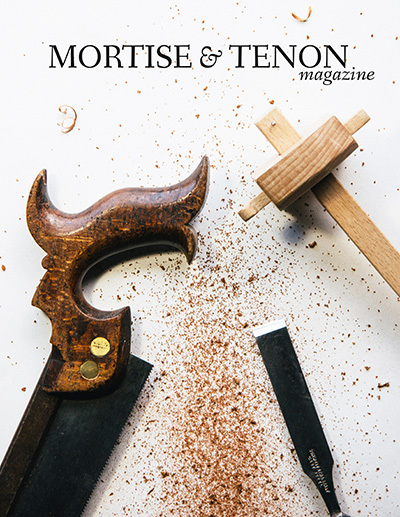 Finally the day has come to take Mortise & Tenon Magazine pre-orders! The “Pre-order Now” button is live at the Purchase page of the M&T website. Check out the updated Table of Contents and put in your order. Don’t forget: As a thank you for your support, all US pre-orders from the website will receive free shipping. For international orders, please check the Purchase page for the list of stockists. Classic Hand Tools is taking pre-orders for the UK and Europe and The Wood Works is now taking pre-orders for Australia. Also, Lee Valley will begin taking all Canadian pre-orders within the next couple of weeks. I will let you know when they’re ready. I have spent many hours this year interviewing, photographing, and writing to prepare Issue One. It has been an incredible privilege spending time with the best of the best discussing period furniture, conservation, woodworking, and scholarship. Al Breed, Phil Lowe, Freddy Roman, George Walker, Martin O’Brien, Jon Brandon, Gerry Ward, Charles Hummel, Zachary Dillinger, and the Yale Furniture Study are all making an appearance in this Issue. It is a truly incredible line up… beyond what I could have hoped for. I’m now hunkered down now in editing mode in order to get the manuscripts off to my copy editor, Megan Fitzpatrick. There are a lot of articles and photographs to work through so I’ll be busy. The printer and I are working out an expected delivery of mid to late February. To all you enthusiastic folks that send me the steady stream of encouraging emails and messages, I look forward to putting Issue One in your hands. Spread the word: Pre-orders are open! Thank you! Can't wait, Joshua! Pre-order made! Best wishes. I'm looking forward to many more years. No worries, Jason. Life is full!